Kristin is a Licensed Marriage and Family Therapist. The founder of Bend Family Therapy, Kristin specializes in treating relationship issues (both couple and family issues), trauma, anxiety and depression, life transition issues, grief and loss, and eating disorders. She also facilitates pre-marital/life commitment counseling for couples. Kristin takes a non-judgmental, caring, and direct approach to facilitating therapy. From early on she connects with her clients and creates a safe and secure space where they can be vulnerable and rise to the challenges necessary for lasting change. Kristin recognizes the importance of mind body connection and teaches tools in session with clients to help them learn to connect with, and to regulate, their emotions and their bodies. She believes that all of us have the innate ability to heal and grow and that therapy can be an avenue to help guide this. 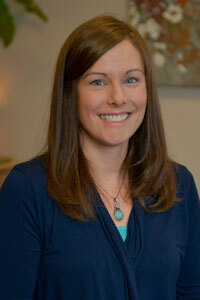 Kristin is a graduate of the University of Oregon's Couple and Family Therapy Program. Prior to starting Bend Family Therapy, Kristin was a therapist for Deschutes County Behavioral Health, Seneca Center and Looking Glass Adolescent Recovery Program. In addition, she is registered with the Oregon Board of Licensed Professional Counselors and Therapists, on their supervisor registry, to provider supervision to therapists working towards licensure. Kristin is trained in a wide variety of therapy models, including, but not limited to: Eye Movement Desensitization and Reprocessing (EMDR), Functional Family Therapy, Motivational Interviewing, Attachment Therapy, Gottman Couples Therapy, Emotion Focused Couples Therapy, Dialectical Behavioral Therapy (DBT), and PACT. She has advanced training in EMDR, Functional Family Therapy and DBT. She is also currently working towards her certification in PACT (Psychobiological Approach to Couples Therapy). In her free time Kristin enjoys spending time with her husband and two daughters. She loves engaging with the outdoors and recognizes the importance of nature to support mental and physical health. She also regularly runs and practices meditation in her own life.